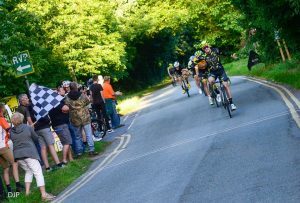 JAMES Ireson (Morvelo Basso RT) sprinted clear with 200 metres to go and held on to clinch victory in round eight of the Shropshire and South Staffordshire Road Race League. The 21-year-old, from Wolverhampton, timed his effort to perfection to take his second win of the series after also winning round six two weeks earlier. The flat course around Charlton, near Shrewsbury, and up the old A5 made for some fast racing with the scratch group averaging over 28 miles per hour. Ireson was part of the scratch group which caught those that set off ahead of them as part of the handicap format with 10 miles remaining. The fast pace leading into the flat finish provided the perfect launch-pad for Ireson to take a clear victory. In a closer fight for second last year’s overall winner Ben Joughin (Pro Vision Race Team) took second while Matthew Garthwaite (Rhino Velo Race Team) narrowed the gap on the overall lead with third. Overall leader (yellow jersey wearer) Kirk Vickers (Rhino Velo Race Team) kept his clear lead with a fourth place finish. “We caught the handicap groups with 1.5 laps to go (of the five lap race) which was perfect timing,” said Ireson. “It meant that it wasn’t all a massive bunch coming into the finish or too early on so it was quite nice. “It was quite a good finish and went into the sprint at 35 to 36 miles per hour and I opened up the sprint so it was comfortable in the end. Last week’s winner Philip Glaze (Stourbridge CC) extended his gap in the veteran’s competition with a fifth-place finish. Jake White (Wolverhampton Whls) was fastest junior in seventh although George Mills-Keeling remains the junior leader following a 16th place finish overall. Lucy Davies (Artic Tacx) also finished safely in the bunch to finish leading woman on the night.